If you’re someone who loves a good handloom sari (like us), you’ll love Kala Sangam. 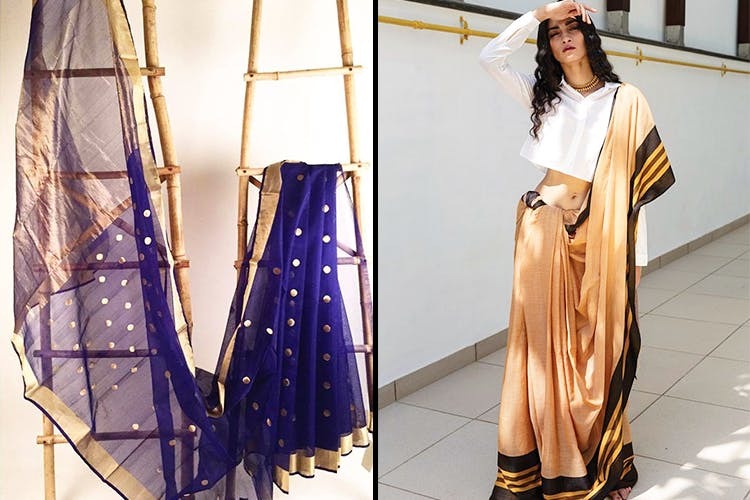 With a variety of styles and pretty saris from all over the country, this store needs to be on your radar for your next sari shopping excursion. Vandana, a person who’s always been passionate about keeping the art of the handloom alive, travels all over the country and personally handpicks the saris for Kala Sangam. Her store in Aurobindo Marg is home to saris from every part of the country. Whether it’s a simple cotton weave from Bengal, a traditional Benarasi, or a Maheshwari from Madhya Pradesh, you can find something from every state here. They keep all kinds of styles, and you can get traditional saris here, as well as more modern ones. Though they sell saris in a variety of different materials, their selection of handloom saris is what they’re winning for. We love how they have a whole store dedicated to the craft, with pieces from all over the country. Their pieces aren’t always exorbitantly priced – they have weaves starting from INR 2,000, going up to INR 1,00,000. Even if you’re in college with a budget, getting a nice, handwoven sari from Bengal for INR 2,000 seems like a pretty sweet deal to us. As convenient as it is to order a sari online, we prefer going to the store and seeing it in person. Head over to their store the next time you decide to pick up a sari for yourself or someone else. You can check out their Instagram page to get an idea of the kind of stuff they keep. We’ll be picking up some saris for ourselves while you’re scrolling through.